Dollface is comprised of 4 young talented girls! 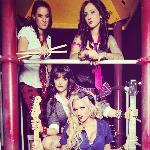 They are a high energy dance, pop, rock band performing a large variety of songs! At a Dollface show you can hear anything from #Selfie to Its Raining Men, and Cotton Eye Joe to Jessie’s Girl. Dollface uses choreography, original songs (and even some head banging) to give the audience a fully entertained night! Dollface regularly performs free shows at various locations throughout Las Vegas. Click Here to check their upcoming schedule.